The creation of this item does not need a genius’s ingenuity. In this case, we mold the record into the shape of a bowl by crushing in its sides and giving them fanciful foliated patters. The centre of the record label serves as the base of the bowl. We can put the record to another utility without actually destroying it. 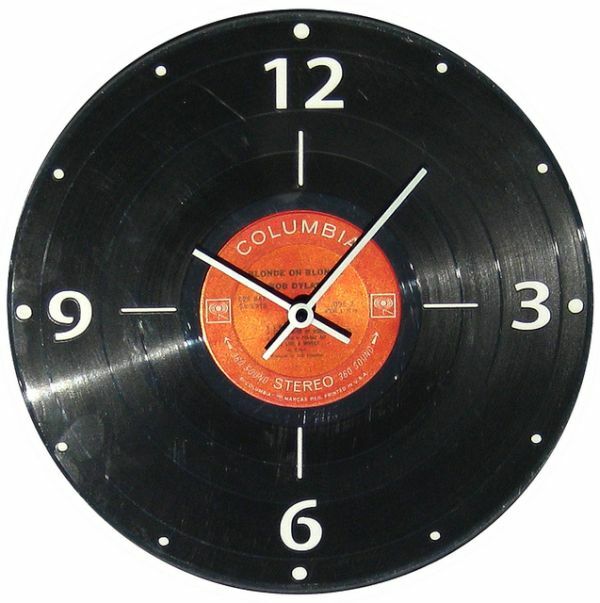 The act involves fixing a wall mechanism on the backside of the record and then sticking time numbers along the rims of the face. Else, we can leave the face of the record blank. We can also cut the record into fanciful shapes to give vent to our artistic expression. Simply cut the sides of two records into the shape of the notepapers that we seek to bind. Then drill in tiny holes on the sides of them in a single file to enable the spiral thread to move into them with ease. 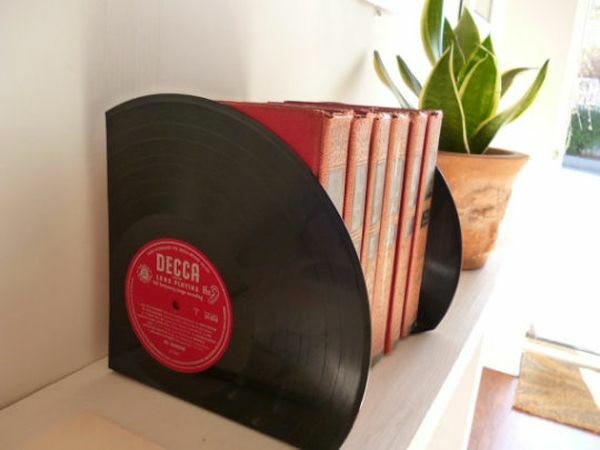 Then place the notepapers inside them and secure them to the vinyl record boards with the help of the spiral strings passing through the holes in them. Remember to cut the records in such a way that the record label remains intact and centered on the notebook. 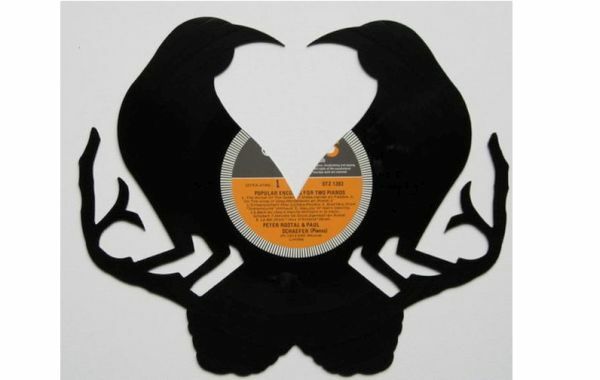 Simply split the Vinyl record into two hemispheres. Cut out a rectangular shaped board from the third to fit in with the length of the two hemispheres. The two hemispheres will be the walls of the box while the rectangle piece will serve as the base. Two additional pieces are needed that will serve as two other walls on the narrower side. Glue them all together with a strong adhesive like silica gel. Your storage container is ready where in you can keep your essential bits and pieces for which you always fumble around in the house. Keeping books in right standing position on table is always a messy affair. 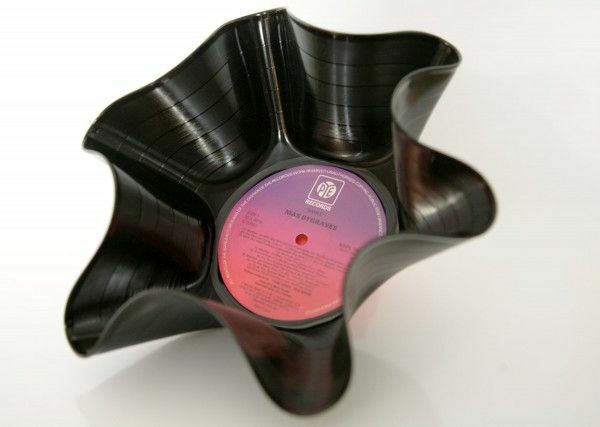 But, with plenty of old records around in the house, there is a solution. Simply fold the lower one- third ends of two records so that they stand erect. Now place them opposite to each other and secure the standing books in between in erect position without fearing their fall. 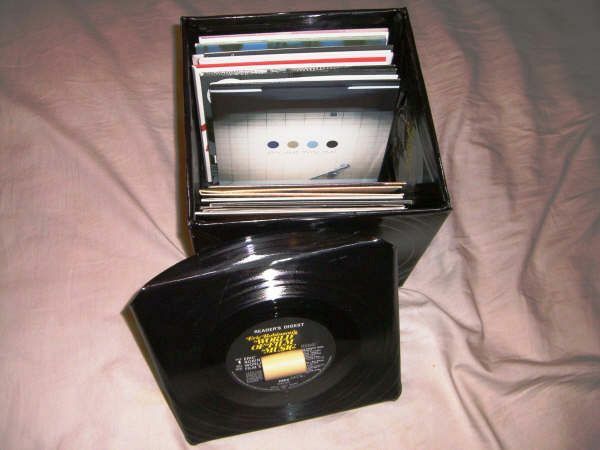 Yet another piece of utility made out from these records that will serve you well is the magazine holder. 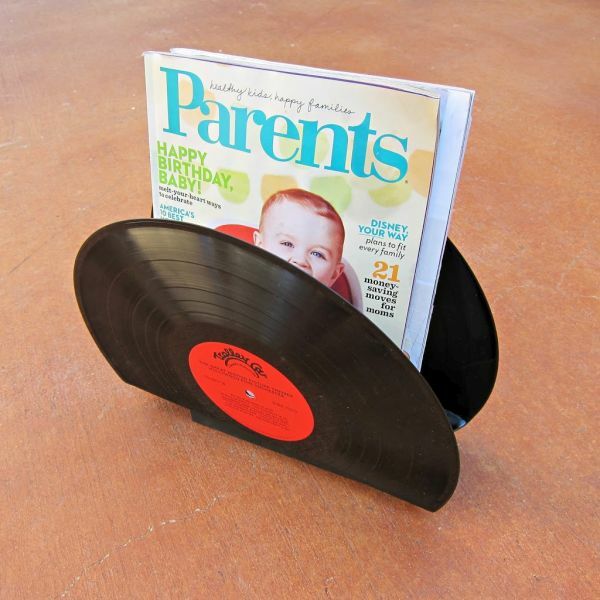 Simply mould about six records in an arch shape and then stick them together one on the other to create multiple spacing for magazines and newspapers. 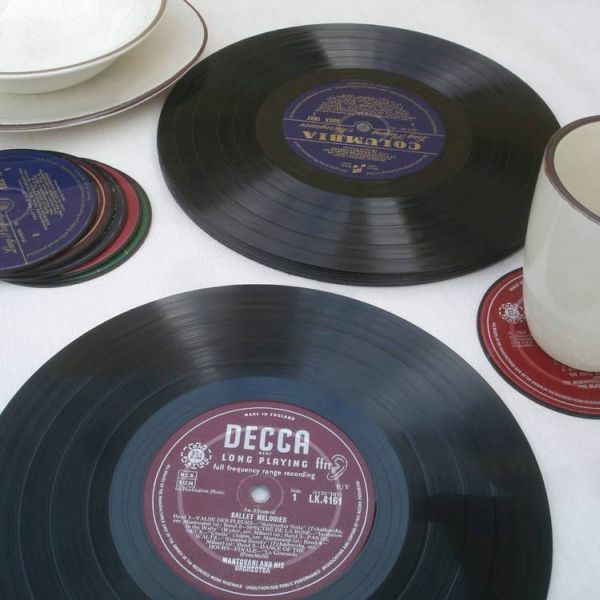 Simply lay down the vinyl records on your dining table to serve as placemats on a dinner party and as the guests settle down for dinner let the discussion, veer towards those golden old days reminiscent by the references of the songs and the singers on the record labels. 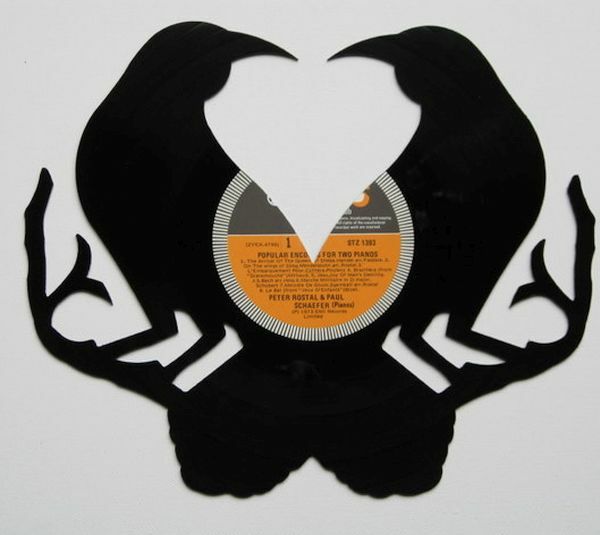 We can cut the vinyl records into a number of shapes like that of a bird, a tree and depending on one’s ingenuity and skills into more complex and fanciful shapes to create pieces of art and décor for our homes and offices. So now instead of wondering on how to rid of the old records lying around in your house, just start wondering how to put these records to purposeful use within your house. There are limitless possibilities of what you can do with these assets that lie dumped in some corner of your house.